Create your own exclusive digfital menu to be displayed digitally on LCD Tv or digital signage at your establishment. When anyone thinks of a digital restaurant menu, most people envision the catalogue screen of a restaurant chain that sells burgers, pizzas or fried chicken. It is true that most quick supply and fast food restaurants prefer such a display, but there is actually a scientific reason for the same. This move is very well thought out and one that is meant to support the service parameters of a quick service eatery. 1. People come into such an eatery to grab a quick bite. Studies have shown that the average consumer looking for easy cooking options prefers going to chain outlets, small delis, coffee shops and the likes. Consumers tend to expect personal service and attention in fine dining outlets as opposed to ones that offer quick bites. 2. The menu is set therefore there is no question about what is available, what isn’t available, what can be ordered and what cannot be ordered, how it will be prepared etc. The expectations of the menu are very clear, right from the start. 3. Most consumers have pre-conceived notions about their food preferences in a quick bites eateries and digital restaurant menu, and therefore, dedicating a larger part of the workforce towards personalized service will only take away from the financial turnover of the business. These are the top three reasons as to why a virtual catalogue of the menu is a lot more preferable for this particular kind of business venture. It is extremely easy to grab the attention of the customers who visit your outlet with a dynamic, interactive menu. Not only that, you can use this product to highlight any schemes or offers that your outlet might be running. While the virtual display might not be able to convey all the terms and conditions of service or of the offer in question, it is quite okay to use such a signage for grabbing eyeballs. The main motive is to get the visitors interested and engaged in your products. For this very reason, virtual catalogues are vital in converting digital menu boards for restaurants into customers. This kind of signage works well even if you are not a dedicated eatery or deli. A hypermarket with a special section for food tasting and purchasing can also make use of such sign boards. This reduces the overall cost that you company incurs as you will not have to dedicate any manpower to the task. At OpenService, we ensure that your menu board is unique, catchy and visually appealing to all your customers. We take into account all details of your business, including your products and the status of your competitors so that with our signage, you can move a step ahead of them in the game. Deb Smith is the author of this article. For more information about digital restaurant menu and digital menu boards for restaurants please visit the website. The digital signage dubai is now expected to be a standard fixture in the QSR and restaurants space. It reduces the cost, it offers up-sell opportunities and it is cost saving with many benefits which combine federal and local legislation which regards the required nutritional information that drives the national chains crazy. The operator of the augmented reality dubai is the ease of the menu which changes in order to accommodate the federal, state and local menu as well as their ingredients. The signage offers an easy change in the sold out items, pricing and new items. It is easy to maintain the updated pricing on the digital menus by the use of automatically or manual control system. The pricing may be managed by the use of central way so the selected stores can get the updates at once. The digital signage software promotes the up-sell for the new items with the strategic integration of the dynamic displays. The signage comes with the graphics that are attention grabbing with many things that are fighting for the attention of the customer. It is going to be difficult for breaking through the message clutter. The digital menu board can display full high definition and bright pictures and video. The touch screen dubai can schedule the show easily within different times of the week or of the day. The business can easily run different promotions and menus which are based on different times of the day. The digital restaurant menu is becoming important for the business that serves lunch or breakfast since using a quick menu board may take place if the restaurant is switching to the lunch menu. The touch screen kiosk can update the digital signage remotely by use of the internet location. This eliminates the printing errors, decreases the expenses and it controls the entire menu board system while managing the entire menu system of the menu board. You may confirm the type of the menu boards which runs in every location while controlling the messages which is displayed to the customers. The digital signage media player reduced the waiting times and improves the experience of the customers. When the message is sent to multiple locations, it ensures the visual consistency and compliance. It can also be used to display the message when it is in the emergency or when it is important to pass the information to the customers faster. There is not cost of the shipping or printing since you can save money through the disposal cost, installation and delivery of the printing of the materials. The digital signage wayfinding can be web based; it can upload or stream into the media player. This means that the content has to be in the server or outside of the media player side. You have to know what you have to do when the internet is not available or when the server is down. You have also to ask if the display can use different RSS feeds and how the display shows the text and the graphics. Before the system is installed in your place; you have to know the type of the warranties of the software and the hardware. Find more information relating to digital signage wayfinding, and digital restaurant menu here. Why Every Restaurant Should OPT For A Digital Menu Board! When it comes to QSR or restaurant business, digital menu boards are all set to become the standard. So what makes them so different and beneficial when compared to your regular menu boards? For starters, technological innovation is encompassing our lives from all sides these days. In such a scenario, it is quite natural that the hospitality industry also uses its myriad applications to bring increased business their way. The beauty of digital technology is that it attracts instant attention from the onlookers. What is the most important aspect of a restaurant that attracts customers? It is its menu, of course! Therefore, those who want to attract customer attention and entice them at a higher frequency need to consider ways to update their menu presentation. So, which is the best way to achieve that? Why don’t you consider digital menus for change? Here below are some reasons why it has become the need of the hour! Everybody knows how changing the traditional menu boards can be! Many times, you need to include special items, chef’s recommendations, and discount offers to the customers. So how can you do it right? The easiest way is to choose digital menu boards, which you can update almost at your whim. Can your traditional boards promise such flexibility? If not, isn’t it time for a change? There is no doubt regarding the fact that a digital menu can also work as a platform for advertising your promotional offers. For example, if you are giving something free with a particular dish or are giving a limited combo offer with slashed prices, do it in the best way possible. With digital menus you can make sure the message is enticing and even include beautiful graphics in an animated format. What’s more, as boards remain in full customer view they can show an enthusiastic response even bringing new business your way. While the installation costs related with the digital boards are high, when one considers the long-term benefits associated with these boards, it makes them an ideal investment. You can change them as many times as you want in the widest possible varieties. Take your time to go through the different display boards available nowadays to pick the one that suits your requirements perfectly. It is possible to customize these boards according to the specific theme and logo of your establishment making them a cost-effective option that provides high returns long-term. Does your restaurant serve the same menu during breakfast, lunch, and dinner? This is simply not possible. So what are you going to about it? With a digital menu board at your disposal, you do not require three separate menus and the need for changing them continuously. You can set timers in these boards and the presented dishes will change according to the time of the day. This will minimize hassles for the establishment and will ensure that undue gaffes in menu display do not occur. Paul Stephens is a published web content writer with countless blogs to his credit to date. His chosen topics relate mostly to technology and electronics because he is a self-confessed tech-junky. He loves to share the latest innovations and marketing techniques with his readers such as electronic message boards, digital menus, etc. 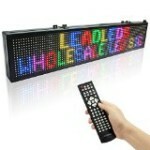 Great Remote Programmable LED Business Sign – 7 Colors! This Money Making Machine Constantly Displays Your Own Messages, Catches Customers’ Attention, Brings Them Into Your Store Among Others!